As we lay on the floor, our chests pulsate with the deep vibrational sound of a Tibetan healing bowl. Sometimes, the bowl physically rests on our heart chakra. Other times, the sound comes from above or beside us. The one constant is RJ Noble; who masterfully creates a symphony of healing waves to awaken and restore our bodies. For as long as he can remember, RJ Noble has been fascinated by sound and vibration. However, it took an unexpected gong chime in a musical instrument store to begin his journey as a sound healer. RJ’s story begins in 2002; when he was perusing a selection of singing bowls. That’s when he heard the gong; and felt his entire body vibrate with a feeling of transformation. RJ was instantly hooked; and, one week later, he returned to the shop and bought his own gong. In the years since, RJ has slowly amassed a collection of assorted healing instruments. Some of his favorites include Tibetan and crystal bowls; each vibrating with a unique sound and frequency. These bowls are what RJ was expertly playing when I first met him in Chiang Mai, Thailand. While in Chiang Mai, I had the honor of interviewing RJ before one of his weekly healing bowl sessions. 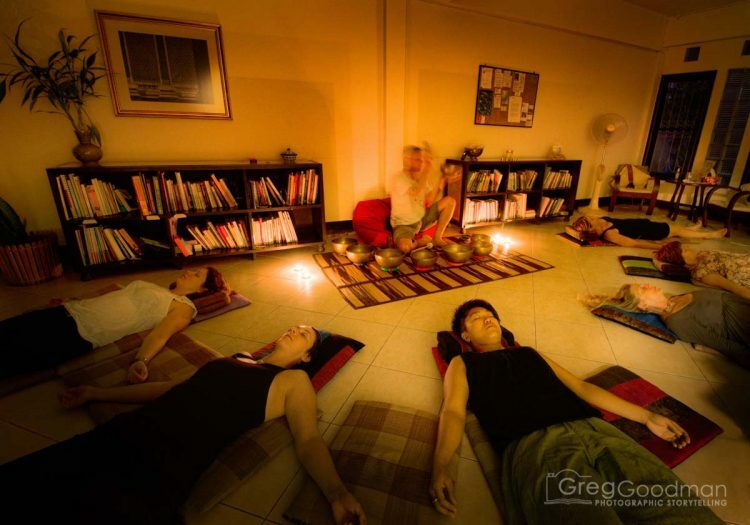 These are the highlights of that conversation; as recorded in 2013.
RJ gives a healing bowl session Healing Light in Chiang Mai, Thailand, on February 21, 2013. GG: What brought you to Chiang Mai and why did you decide to stay? RJ: Four years ago, I was in a position in my life where I needed a huge change. I was living in a really old house in Hampshire, England; which I used as a healing space. People would stay with us for energy work and massage; and, to explore the countryside on bike or horseback. After certain life-changing events, I wanted a bit of adventure. So, I rented out my home for 6 months and took a world tour. And that was four years ago? Yes. During that time, I visited and volunteered in Australia, Bali, Cambodia and Sri Lanka. I also spent quite a bit of time in and out of Chiang Mai; but, I didn’t know why. I hadn’t yet found the right people; not like I have today. Then, while living in Bali, I met a lady from Chiang Mai who invited me to be part of a healing festival she was organizing. I said yes, came back to Chiang Mai and that was it! From there, I met all these people here. I met the healers, teachers and everyone else I could talk to. That was when Chiang Mai really started to become a home. So, I am very happy here. It does feel like home. I haven’t been here for that long; but, my heart is here and that’s what you need to have. Let’s talk about your bowls. I’m so happy to have a set of bowls here in Chiang Mai. They satisfy my love for sound, energy and healing. Each one is hand-made for a certain sound and vibration. When played, they target the body’s core and its major energies. I bought them in Chiang Mai; though, they are imported from Tibet, India or somewhere else. Can you tell me more about the sound and vibration? Every bowl makes a different sound and vibration. I love that sound. It’s so good. Every bowl makes a different sound when struck. How do you “play” the bowls to get a certain sound? The hammer is a fabulous, fabulous tool. It’s what allows the bowls to really do their healing work; which, I love. There are so many ways to make different vibrations and sounds from a simple tap of the hammer. You can use it to strike the outside of the bowl. Or, for a much deeper vibrational sound, I can rotate it around the outer edge. I don’t. I just… I don’t. So you do it through feeling as you go? The whole process is completely heart felt. It’s a feeling, yeah. During most sessions, I work with three or four different size bowls. To start, I use the bowls that make a fairly high pitched sound. Along the way, I play certain bowls on the body. That creates a deep vibrational sound; which goes straight through the person. Sometimes, I play two or three at the same time. I might rotate one, strike another and breathe on a third. That way, you get deep with one and create backup sound with the others. Then, I like to finish with two bowls that have a softer tone. That helps the body awaken to a beautiful sound. With a few bowls, I can change the sound vibration by just open and closing my mouth. That increases the volume or sound vibration. Which is your favorite bowl? I’m not sure that I have a favorite. Well, I’m really a heart-centered person and I’ve got three heart bowls here. This is my possibly my favorite heart bowl; it’s a heart centered bowl. I love it for individual sound work – where the bowls are placed very close to someone’s body – and for group work. Like this session we’re about to have; where people lay down with their heads towards the bowl and I play the sound and vibration. As I said, I am a heart-centered person; so, I usually use the one I just showed you. Yes. This is my favorite. At this point, the room had filled up with people coming for RJ’s weekly healing bowl session. So, I offered a huge thank you and hug before laying on the floor, pointing my head pointed towards the bowls and waiting for the gentle bath of sound and vibration. You can also hear RJ describe his work in his own words by watching this video, created by the amazing Katy Bullen. Have you ever experienced a sound healing?